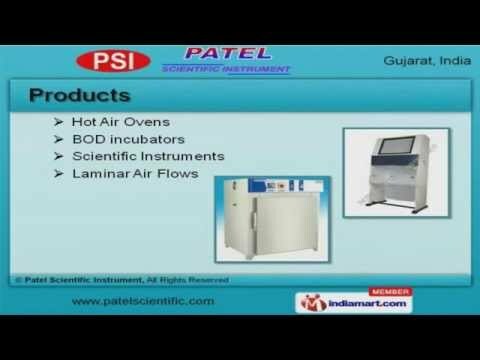 Welcome to Patel Scientific Instrument, Manufacturer and Supplier of Scientific Instruments. An ISO 9001 2008 certified company, established in 2000 at Ahmedabad. Our products are applicable in Hospitals, Research Laboratories and other areas. Ultra Sonic Cleaner and Shah Sales Corporation are some of our elite clients and we are backed by Hi tech designs and easy installations. We offer a diverse range of Hot Air Ovens, BOD incubators and Scientific Instruments. Our Tray Dryers, Scientific Chambers and Muffle Furnaces are well known for their impeccable performance. We also provide Bacteriological Incubators, Laboratory Autoclaves and Fume Hoods that are available at market leading prices. We are offering a top notch quality range of Bio Safety Cabinets, Orbital Shaking Incubators and Ultra Sonic Cleaners. Our organization is instrumental in offering a wide gamut of Dyeing Machines, Dispensing and Sampling Booths. Bacteriological Incubators for Research laboratories, Dispensing and Sampling Booths for Agriculture Institutions are a class apart.